On Wings of Eagles: What Does God Say About Speaking Up? God has given us a powerful way to help others, be bold and show kindness. Speaking up for people means using your words to help them. Next time you’re at school, work, or church, be aware of when you should speak up for someone. If you see someone pushing or hitting another child, tell an adult. If you hear a classmate teasing someone on the playground, tell the bully why that’s wrong and then say kind words to the person being teased. The tricky part is knowing when to speak up, and that comes with wisdom. You can gain wisdom by reading the Bible, listening to teachers, friends and parents, studying hard and praying. How can you reach out to someone today? Dear Lord, we are thankful that You gave us a voice to speak up for others. Please give us wisdom to know when to stay silent and when to use our words to defend someone from harm or show kindness. Please give us ideas for what to say and do to help the people we meet. In the Name of Jesus. Amen. 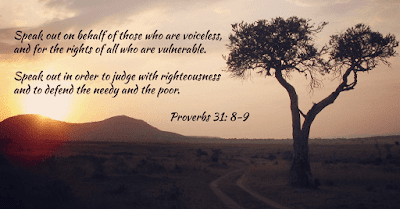 Labels: What Does God Say About Speaking Up?